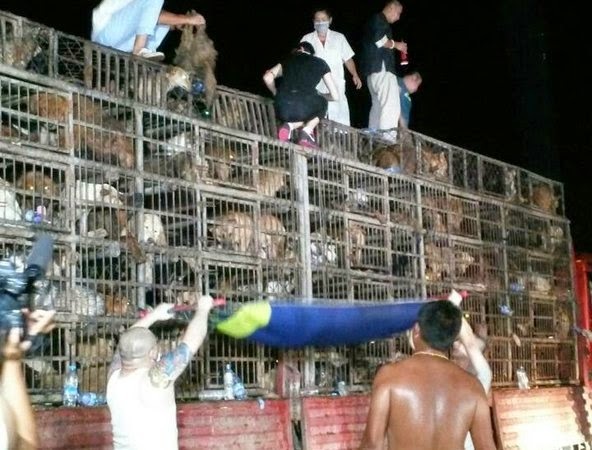 Grassroots activists in China, using social media to alert authorities and fellow volunteers, managed to stop five trucks carrying over 2400 dogs headed for a grisly fate. No joy ride was this—the dogs, many of whom were stolen pets, were headed for someone's dinner table. According to this New York Times article, "all but 30 of the dogs had been adopted or sent to temporary homes and shelters," as of a few days ago. Unfortunately, some of the dogs died in route, and many needed veterinary care. Interestingly, China has no animal anti cruelty laws, but the younger generation has stepped up to the plate, so to speak, and used social media to spread the word about compassion for animals. And eating dog meat has become a lot less fashionable, in recent years, again thanks to the use of social media. We think this is quite the story and a testament to the power of a small group of people to effect change. Let us know what you think! Yes and so glad the tide is turning. Have a terrific Tuesday. We were sickened to read this. Thank doG for the younger generation!